Becoming lost in the woods…. Have you ever been lost in the woods? These days most of us, when we become lost, are more likely than not wandering an airport or big public parking garage looking for our vehicle. Right? I’ve never been really lost out there. There are stages of lost-ness, I think. There is the “lost the trail” lost, which means wandering off a trail without realizing and then trying to find one’s way back. This is how most people get truly lost, this way, I think. 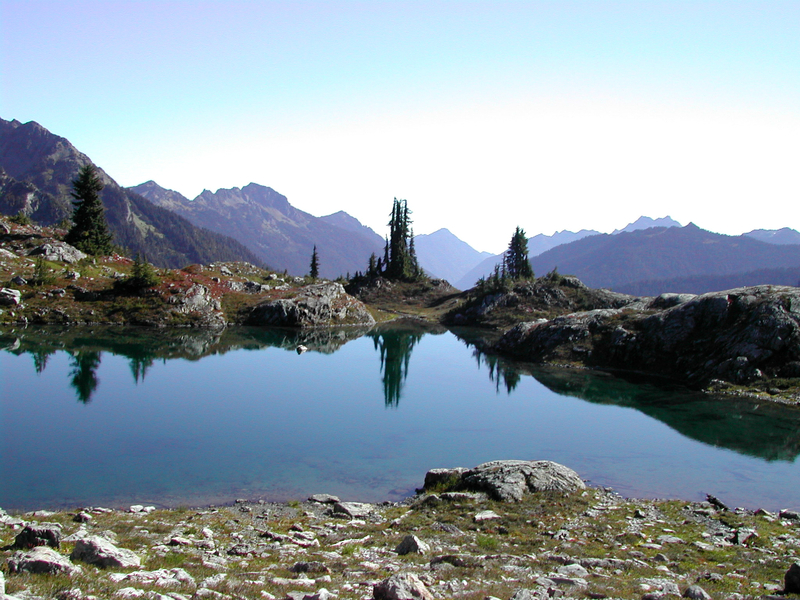 I met a guy in my writing class in 2013 who went into the Olympics and started up the Three Lakes Trail toward Skyline ridge in the southwest Olympics, off the Quinault, and somehow missed a turn and ended up lost for five days. He got out OK, chilled, but that’s a long time to be missing. So he went from “lost the trail” to being really lost, but of course knowing the general area he was in. Then there is the totally lost condition, not even knowing the general area, this coming when say a plane crashes in the wilderness somewhere and you survive. But, three times, I wandered off trail and was for a time “lost.” I wasn’t lost for long the first time. I was hiking up to Dodger Point and, low down, the trail jogs sharp left and up to start up the ridge after crossing the Elwha (I think that’s where it was, it was 25 years ago) and I kept going ahead, on the open forest floor, until say thirty yards in I realized I wasn’t on the trail any more. That was startling. An interesting thing happens to you when you lose a trail, or to me, anyway. Everything shifts. That first time I backtracked and sure enough found the jog right away. The second time I was lost could have been more serious. I was alone, up on the Skyline Trail, July Fourth weekend a year with little snow, absolutely alone, my second day in, way up high past Kimta Peak, the next pass, maybe Hee Haw Pass? Anyway its rocky and bare up there, cairns, but enough snow to cover the cairns, and the trail there wanders down this rocky defile a ways then also jogs left over a little deep creek, but the ground is open and well trod and so I missed that jog and wandered this way, then that, and always the trail petered out. I am way in, it has just started to rain, and it then rained for three days, never been up there before, and now cannot find where the trail goes. That time it took me a half hour to find the jog and the trail. I knew enough to know that when you lose the trail you backtrack, first, and second you don’t go wandering off without a real clear idea of how go get back, because it’s rough country up there and if you get off far enough, down say a steep side hill, then you can get turned around and then you are lost, like my classmate got lost. The third time is embarrassing. I had a new pair of boots, and hoped they were broken in. I had walked in them and gone up and down gravel sidehills with them, but they were new and I knew they were not yet ready, but it was a nice day, sunny, dead clear, I had the day off, and the Brothers beckoned, so I drove to the trailhead to Lena Lake, was on the trail by 6am, and tried to climb the Brothers. This, like the two events above, was the first or second year I was out here, maybe 25 years ago. I was younger than now and felt strong and was really stupid because right away I knew the boots weren’t ready but, dammit, the day was FINE, so on I went. The climber’s path to some campsites in the Valley of Silent Men is pretty easy to follow, and then you get above trees and I climbed up and up and up, in the hot sun, feet starting to burn, now, but dammit I was close! I reached the final summit block, where it gets a little exposed, and by now I know my feet are gonna be a big problem. I turned around maybe 200 feet below the summit and worked my way down to the campsites off the rock, which took a damn long time, several hours, and when I got down there I got all turned around. I stopped and thought, I should take my boots off, but knew if I did I’d never get them on again. But somehow I got turned around and could not find the path down to Lena Lake. This took me two hours, wandering and looking. I was in a lot of pain and feeling stupid and not too rational, probably seriously dehydrated, nobody else around all day, afraid to remove my boots. That time, for a half hour, I was afraid I was really lost, wandering the woods, maybe getting further and further from the trail, and that was scary and sobering. I stopped and sat and took some breaths and relaxed, drank water, and checked the sun, the slopes, and found the trail. I got back to my car at 7pm, 6000 vertical feet up and 6000 vertical feet down later, and when I took off those boots the skin on my feet up to my ankles came off too. This was the first of several embarrassing boot stories, but (hopefully) the last of my lost stories, all of which were many years ago. But, still, that shift, that change, when you realize you don’t know where you are – that gets your attention.